Ella is a teen with synesthesia – a rare medical condition that scrambles the senses and allows Ella to see colors that reveal people’s true emotions. She uses this attribute to suss out when people are lying, however she admits it is not always correct. 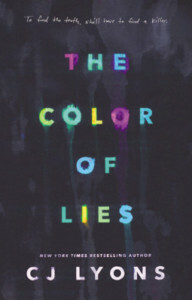 She says there can be so many layers of color that it can be difficult to tell truth from lies. Then she meets Alec and not only can she not see any colors around him, he turns her whole world upside down. He’s come to find out the story behind her parent’s deaths and he believes it was no accident. What follows is a twisty story of lies and deceit where Ella must figure out who’s on her side… and who wishes her harm. What drew me to this book was that Ella has synesthesia; I have heard of this condition so I was curious to see how it was portrayed in the story. I was not disappointed; the author does such a wonderful job describing Ella’s version of synesthesia that I could visualize what was happening when she talked to other people. Overall this was an interesting story and I read it quickly but the mystery wasn’t as surprising as I had hoped it would be. I did enjoy the all the characters and their relationships. However I feel like while this could have been a very shocking ending, it felt a little flat for me. I think that’s purely because I have read too many thrillers, many of them geared more towards an adult audience. I think it felt a little too rushed at the end and this is probably because it is intended for younger audiences. All this is not to say I did not enjoy the book, however. I really did and would recommend it for those who enjoy mysteries and those who like other teen books.